Eventhough the temple opens at 5.00 am, for about one hour, Suprabhatam is recited, followed by Archana to the deities from 6 a.m. to 8 am and in evening Pooja is held between 6 p.m. and 8 pm. However for general public darshan the above daywise timings in table only apply. 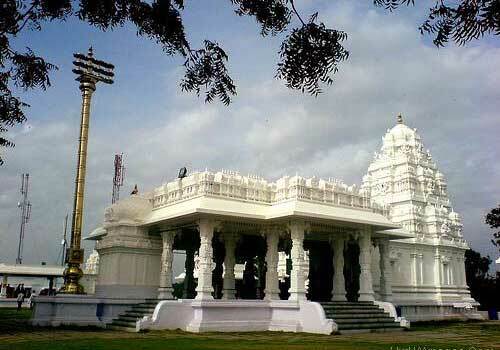 Sanghi Temple Hyderabad: Situated in Sanghi Nagar which is 25 km away from Hyderabad city, Sanghi temple stands beautifully on the hillock ‘Paramanand Giri’. 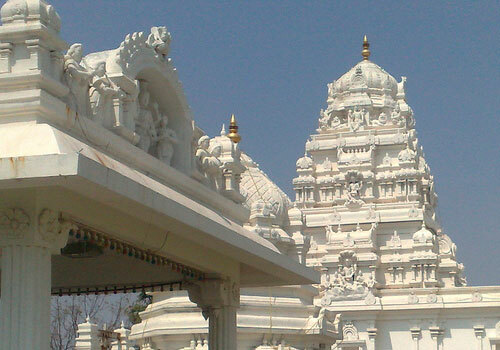 Built in the Chola-Chalukya style of architecture, the temple is a place worth visiting. This temple was built in the year of 1991 which was completed in a just 18 months! And since then it has been attracting tourists from everywhere. As the name suggests, it was developed by a leading industrial group of Southern India - Sanghi Group. They primarily operate their business from the city of Hyderabad. 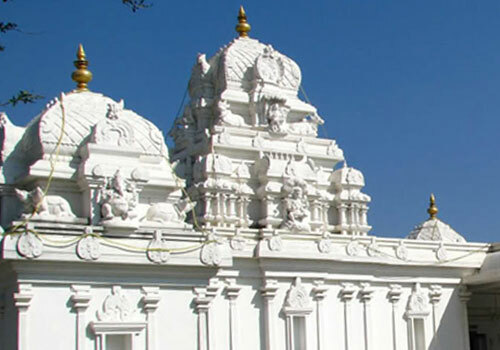 Sanghi Temple in Hyderabad captivates everyone with its architectural beauty as much as with its religious associations. 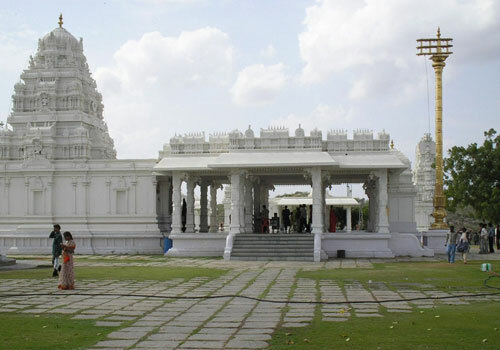 Sanghi Temple, one of the popular Hyderabad sightseeing places, is also quite famous location for various movie shoots, resulting in its increased popularity. 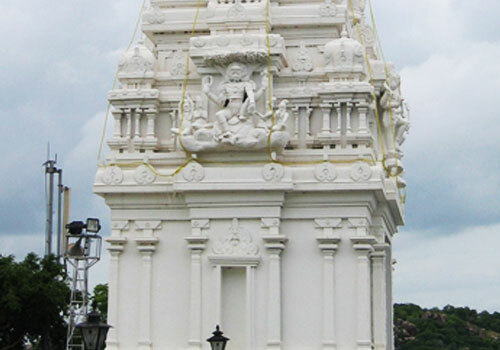 Although the main deity of the temple is Lord Venkateshwara, one can find other important Hindu Gods as well. The idol of Lord Venkateswara is said to be the replica of the one that is in Tirumala. 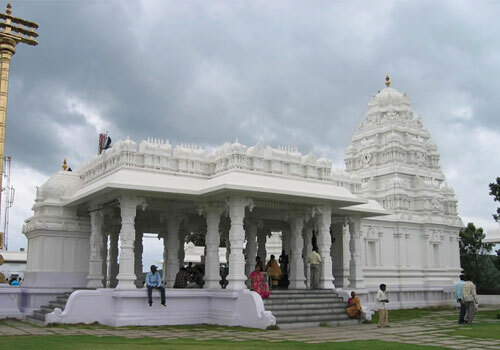 Near the temple of Lord Venkateswara you will find Parvati Temple. Tourists can also find Lord Anjaneya while on the way to the main temple. Another nearby temple houses Lord Shiva along with Goddess Kamalambika. Situated close are also the temples of Lord Rama, Lord Ganesha and Lord Kartikeya along with that of Goddess Durga. The temple complex has a holy garden called as Pavitra Vanam which provides for the flowers and leaves used for performing prayers. 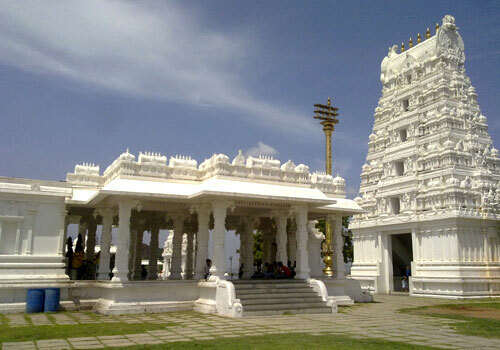 The temple also has a Kalyana Mandapam where auspicious functions and ceremonies such as marriages are performed. The vast complex of this temple also offers amiable space for visitors to sit at leisure and bask in its beauty. The lawn in front of temple, which has been beautifully maintained, offers a perfect setting to sit and relax. The Sanghi temple timings are from 8.30 am to 10.30 am and 4 pm to 6 pm. If you are keen on attending the pooja, plan your Sanghi temple visit around 6pm and 8pm. This temple is perfect getaway for a weekend. Either with family or alone, you can visit anytime with anyone! For those who are planning to visit over the weekends, there is no cause to worry as the Sanghi temple timings on Sunday is same as its timings on other days of the week. If you are visiting Sanghi Temple, do try to catch the glimpse of the temple in night. When lighted, the view is spectacular. Visiting during festivals such as Shivaratri, Sri Rama Navami, Krishnashtami, Vinayaka Chaturthi, Dussera, Hanuman Jayanthi and Brahmotsavams can be a good idea as these festivals are celebrated with much enthusiasm and devotion. Tourists can also plan a trip to various other sightseeing places such as Ramoji Film City which is less than 1 km away from Sanghi temple, Birla Mandir, Golconda Fort, , Salar Jung Museum, etc. too. A slight planning of the day taking Sanghi temple timings is required so that you can visit the other places nearby within the same day itself. I have visited Sanghi Temple many a times. I have been going there since my childhood days. Have been attached to it since then…its beauty attracts me..What makes it better than many other temple is its maintenance…the laws are well kept…I usually sit and enjoy some calm time here. Although the Sanghi temple timings starts from 8.30 am, it is better to start early so that you can enjoy view of nature too. And yes go before it gets crowded..
Sanghi Temple is for sure quite far away from city..it is almost 10 km from even the Ramoji Film city . This is what makes this temple so peaceful. Best thing is unlike other popular temples, there were no pandas to pester us..we went and did our offerings with any difficulty..we relaxed and came back. The only thing to keep in mind is the Sanghi temple timings. Although everyone says that we must go in winter...but I went to sanghi temple in monsoon.. I loved it! Although I didn’t like the facilities.. there was nothing as such, I liked the architecture of the temple. Its Beautiful.. As it is located on top of the hill…the view from top was mesmerising, the view in evening in especially good. The opening Sanghi temple timings are only till 6 pm in evening.. I wish I could stay there longer in night. We started late so couldn’t enter on time! A bad start of our day…and to top it ..temple was too crowded..it seems entire Hyderabad had come to visit it! Anyway because we had gone there, we decided to wait till 4 to enter the temple. Just a two hours of wait…but it was worth waiting…its beautiful..infact even while waiting we enjoyed the view around…go at least once.. This temple has a very pleasant touch to it..we visited it on my visit to Hyderabad. We didn’t know about it much but our hotel guys had told us about it. It is quite famous for movie shooting ...so we also decided to go and visit. It is a place everyone should visit. At our hotel we were told that Sanghi temple timings (opening and closing) are from 8.30 in morning till 10.30 am only..and then later in evening it opens..so we went early in morning…plan your visit according to timings or else you will end up waiting till evening!